In a previous post we discussed leading and lagging indicators and that post helped us to better understand the difference between metrics and how they relate to the sales process. In this blog we’ll explore different conversion metrics in detail and look at how we can improve revenue and drive sales growth. Conversion rates measure the ability to move deals through the selling process. Each deal begins life as a lead and progresses through the sales stages until it is either won or lost. By analyzing how deals move from stage to stage we can identify areas that fall short and areas that perform well. An important step companies take when they implement a sales process is to define the sales stages they want to follow. Depending on the selling model of each company there may be somewhere between 3 to 20 sales stages. For example, a company that sells online using a zero-touch model might only have 3 stages: Open,Won and Lost. A company that has a more complex buyer’s journey could decide to have many more stages. However, no matter how many stages are relevant to a business, these stages can be grouped into key phases. The following example illustrates 4 significant phases or milestones (+ New) to measure how far along the sales process deals are. The example above allows me to see the number of deals that progress to the next stage. This diagram is a classic sales funnel as we see all deals start off “New” (shown as 100%) and then we see decay (dropouts) as the sales process plays out. In the example above, about 50% of all deals end up Closed-Won, let’s call these declining percentages “Survival Rates.” Survival rates describe where deals leave the sales funnel, but survival rates don’t directly show the ability to convert from stage to stage. In order to achieve that we need to convert them to conversion rates. The notion of the sales “funnel” stems from the common perception that you start with a lot of input which is constantly narrowed down from stage to stage until only a fraction survives, your Closed-Won deals e.g. the survival rate. What is more useful than only looking at the survival rate is to understand where in the process there is the most decay, e.g. the most dropouts in the sales cycle. This is the conversion rate and it relates exactly to the key sales metrics needed to monitor and improve sales growth. The transition between stages represents our ability to pick up a lead or opportunity and to move it to the next stage. We can use the survival rates to calculate the conversion rate between the milestone sales stages by calculating the ratio between stages. e.g. if the survival rate for Negotiate is 70% and Closed-Won is 50%, then the Negotiate to Closed-Won conversion rate is 50/70 = 71%. 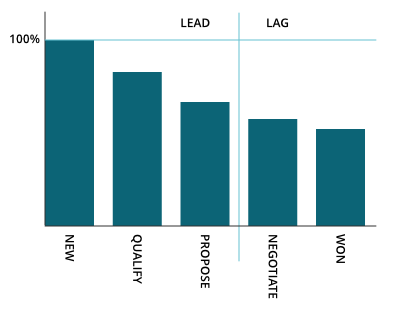 Sales Qualification Rate: The ratio of leads that become qualified opportunities. This is a measure of the quality of the leads fed into the funnel and the ability to contact, analyze and convert to opportunities. A low Sales Qualification Rate could mean not enough high-quality leads are being generated, or leads are not being followed-up. Negotiate-to-Win Rate: The ratio of opportunities won after negotiating the terms of a sale. A low Negotiate-to-Win Rate may indicate there is a competitive disadvantage or the sale price does not meet expectations. While the conversion rate provides insight into how well a company is performing and where the sales function is falling short, it’s not the end of the story. Companies also need to consider sales volume. For example, the conversion rate might indicate that a sales territory has a Proposal-to-Win Rate of 100%, but they’ve only closed a small number of deals. This isn’t necessarily considered a good outcome if a company is looking to drive revenue growth. Only when we consider conversion rate in the context of volume can we start to see where we need to focus efforts and improve revenue delivery. The ability to focus effort where it has the most impact on the bottom line is critical for growth. The ability to see metrics such as conversion rates and sales volume expressed both as deal count and value alongside each other gives companies the ability to monitor exactly where focus needs to be placed to have maximum impact. There’s no value in just being busy if efforts can be channeled to monitor key metrics in a way that has a measurable return. 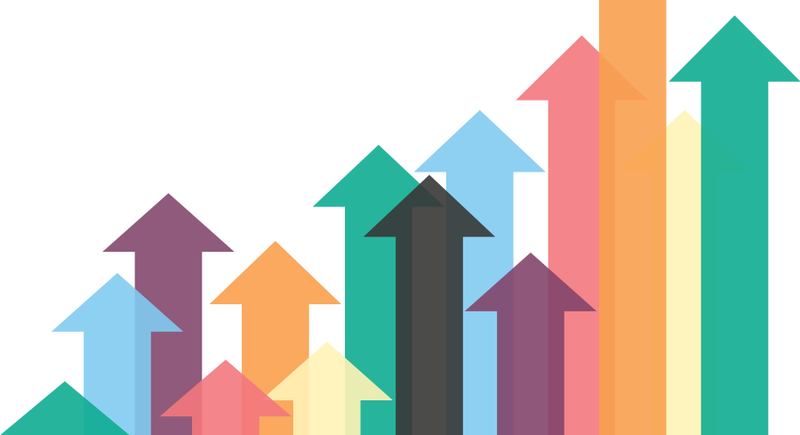 We’ve seen how conversion rates and sales volume can be combined to focus on driving improvement into the sales process, but there is also a lagging indicator that can provide greater insight into the metrics that really matter when growth is a focus. Average Deal Size is the average sales price of each closed deal and can be a significant indicator of the sales process. In some industries in the last few years there have been big changes in how products and services are purchased. Larger deals tend to require more effort to close as the buyers are more complex and as a result companies tend to close fewer large deals, but if a large deal is lost or deferred then risk increases. With this example in mind, a deal that is significantly larger than the average deal size needs to be identified and managed as part of the sales forecasting process. Average Deal Size has a longer-term context as well. If there is an increase in Average Deal Size over time then this indicates that the pipeline is likely changing. It may be necessary to carefully review how lead generation and the sales process needs to adapt and change to react to market changes. Making better use of historical data about opportunities makes it easy to look back, make decisions and evolve the selling model. Using historical data to deliver benchmark metrics and present conversion rates that show how opportunities progress through sales stages delivers a truly powerful sales engine. Managing the sales process by monitoring important metrics as deals progress means improved focus. Efforts can then be spent in areas that are likely to see the most important improvements. The inclusion of benchmarks such as Average Deal Size allows us to not only see the immediate areas that require focus but also understand the background environment in which a sales team operates. The advantage is changes are spotted early and the model can be adapted when necessary. The ability to fine-tune the sales engine is the method by which improved performance and sales growth can be delivered. The most significant outcome when conversion rates are used is a better understanding of the sales journey, which focuses efforts on the exact points in the process to help improve outcomes. We should resist just being ‘busy,’ and instead, analyze where in the selling process improvement is needed and focus on the points in the process that will deliver the greatest increase for growth. We looked at why sales volume is important when using conversion rates and we looked beyond the current opportunities using Average Deal Size to better understand how our pipeline is changing so we can better evolve our processes. For mid-size and large organizations that manage sales teams in different regions or channels, it can be expected to see different conversion rates and opportunities for improvement. Keeping conversion rates up-to-date and presented to sales leaders in an easy to use way and alongside background metrics can become complex. While designing Vortini we have focused on making sure that important metrics such as conversion rates are kept current and delivered right across the sales hierarchy. This means that sales directors and team leaders have the information they need right in front of them to focus on driving growth. Contact us today to learn more about Vortini and our library of metrics that improve sales effectiveness and drive revenue growth. Alan is the Chief Product Officer at Vortini, and has been working with sales data for many years. He has helped organizations make sense of this data and deliver systems that can make a real difference for sales outcomes through a better understanding of the metrics and processes in many different industries.